Hudson's Bay sent out an exclusive promo code to their email subscribers today that we can share with you all! Save an extra 15% off on regular-priced, sale and clearance women's apparel and shoes! Enter the promo code 4EMAIL at checkout or click here for the in-store coupon. Offer is valid May 30-June 2, 2016. 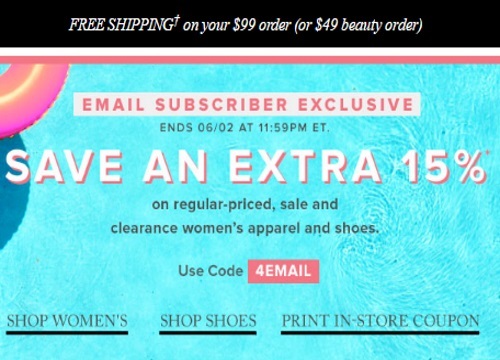 Free shipping applies on orders over $99 (or $49 with beauty orders).